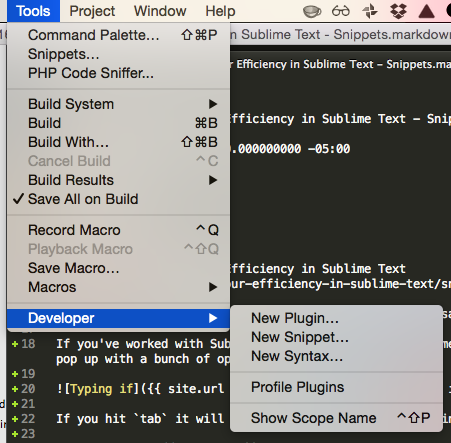 As we talked about last time, Sublime Text will autocomplete specific keywords that are defined by either the Sublime Text crew or a plugins developers. What if I told you that it’s possible to create snippets to create your own keywords to speed up your development. Now I can (and have) copy and pasted that over and over again but I can create a snippet so I can type a short keyword, hit tab, and the code will automatically fill in. This will open a new snippet file. Like settings these are just text files so you can easily back them up and move them around. The snippet files are saved in “~/Library/Application Support/Sublime Text 3/Packages/User” on OSX and “%USERPROFILE%\AppData\Roaming\Sublime Text 3\Packages\User” on Windows. The first thing we’re going to do is to save this. When you save the file it’s VERY important your file extension is “sublime-snippet” or it will not work. We’re going to name this “apath.sublime-snippet” (for reasons that will become apparent shortly). Now apath doesn’t do anything special outside of twig files. The thing I love about this is that you can tab between the different fields so it’s easy to fill in the needed values. After you’ve tabbed though all the fields it will move the cursor to the end of the line so you can keep typing. In this case it’s fairly evident what we want to insert but you can also add placeholder text to explain it. There are a couple fields that have special significants inside the snippet. If you’re interested there’s a list available online. For the most part I’ve never needed to use most of them but the $SELECTION field can be helpful but a little difficult to use. The $SELECTION field takes what’s selected and places it into the $SELECTION location. To get this to work type the tabTrigger then select the text plus the tab trigger and then press tab with the cursor at the end of the tabTrigger.